SIGNIFICANT LANDSCAPES | who's that knocking...? 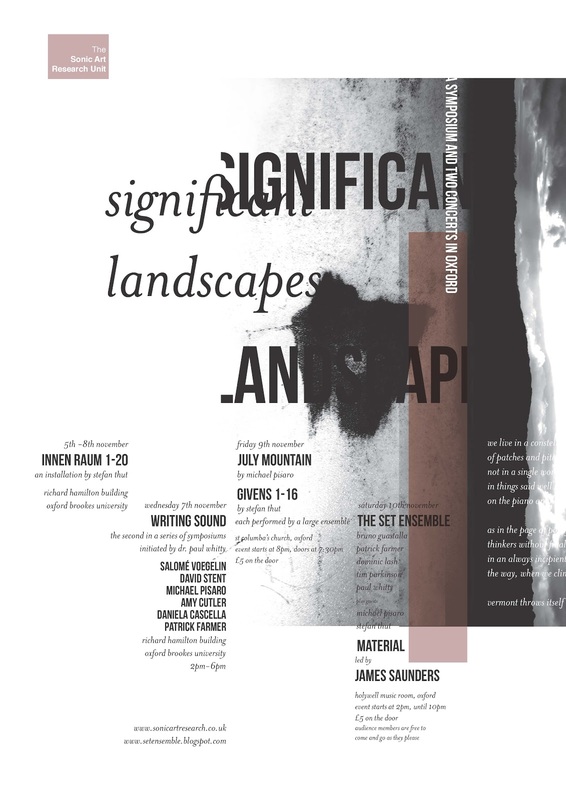 an exploration of sound, silence and writing including a live premiere of Michael Pisaro’s July Mountain; Givens 1-16, a work written specially for the event by Stefan Thut; Writing Sound, a symposium featuring contributions from Salomé Voegelin, Michael Pisaro, Amy Cutler, Daniela Cascella, David Stent, Patrick Farmer. Plus, on the 10th November there will be an all day event at the Holywell Music Hall in Oxford, eight hours of new works written for the event by the Set Ensemble, plus guests, Michael Pisaro, James Saunders and Stefan Thut. Monday November 5th, 9am – 9am. Other dates TBC. A 24 hour playback of a sound installation by Stefan Thut. Wednesday November 7th, 2pm – 6pm. The second in an ongoing series of symposiums entitled, ‘Writing Sound’. Speakers will include; Daniela Cascella, Amy Cutler, Patrick Farmer, Michael Pisaro, David Stent, Salomé Voegelin. Friday November 9th, doors open 7:30pm, for a prompt 8:00pm start. St Columba’s Church, Alfred Street, Oxford, OX1 4EH. Live premier of Michael Pisaro’s July Mountain and Stefan Thut’s givens 1-16 (written for this event). Participating in this concert will be; Daniel Bennet, Seth Cooke, Stephen Cornford, Jane Dickson, Lawrence Dunn, Patrick Farmer, Bruno Guastalla, Jack Harris, Kostis Kilymis, Lina Lapelyte, Dominic Lash, WIll Montgomery, Michael Pisaro, Samuel Rodgers, David Stent, Greg Stuart, Fern Thomas, Stefan Thut, Paul Whitty. Saturday November 10th, 2pm – 10pm. The Holywell Music Room, Oxford, OX1 3BN. An all day event featuring the Set Ensemble and the James Saunders led Material. Writing scores and performing in this all day event will be; Patrick Farmer, Bruno Guastalla, Sarah Hughes, Dominic Lash, Michael Pisaro, Tim Parkinson, Stefan Thut, Paul Whitty. Audience members are free to come and go as they please throughout the day. Beginning on the 5th November and lasting until the 10th, Oxford Brookes University, St Columba’s Church and the Holywell Music Room will play host to a diverse series of events curated by Patrick Farmer, Dominic Lash and Paul Whitty. The full programme for these events can be downloaded as a PDF by clicking HERE. 5th/6th November. 9am – 9am. Drama Studio, Richard Hamilton Building, Oxford Brookes, OX3 0BP. A 24 hour long playback of Stefan Thut’s sound installation, innen raum 1-20.
innen raum 1-20 was recorded on September 21st/22nd 2009. Starting at 9am in Solothurn (CH) at the now abandoned Capuchin Monastery. The 24 hour recording will be played sequentially throughout the day via 20 portable cd players. innen raum will be played back again on Thursday 8th November, utilising a different approach to the recordings. 7th November. 2pm – 6pm. Writing Sound. Writing Sound is a project of the Sonic Art Research Unit (SARU) that takes the form of an annual symposium. Writing Sound explores connections between listening and writing, sound and text, audition and record. Patrick Farmer – curator of this year’s symposium – has invited practitioners from the fields of visual art, cultural geography, experimental composition, and sound art, to join him in sharing their thinking and writing, their approaches to recording the experience of reception, and negotiating the complex and subtle relationship of location, action, sound and word. Salomé Voegelin – Airplanes landing. David R J Stent – You Hear Intimate Proximity. Michael Pisaro – A lot of silence. Amy Cutler – ‘Sung through the forest mirror’: The forest echo and non-singular language. Daniela Cascella – Listening, Reading, Writing. Patrick Farmer – What shall we love if not the enigma? 9th November. Doors at 7:30pm for an 8:00pm start. Large group realisations of both Michael Pisaro’s July Mountain and Stefan Thut’s Givens 1-16. Daniel Bennett, Seth Cooke, Stephen Cornford, Jane Dickson, Lawrence Dunn, Patrick Farmer, Bruno Guastalla, Jack Harris, Kostis Kilymis, Dominic Lash, Will Montgomery, Michael Pisaro, Samuel Rodgers, David Stent, Greg Stuart, Stefan Thut, Paul Whitty. 10th November. 2pm – 10pm. An all day event featuring the Set Ensemble, plus guests Michael Pisaro and Stefan Thut,and Material, led by James Saunders. Audience members are free to come and go as they please. An infinite amount of thanks to Richard Pinnell for designing both the poster and the programme. This entry was posted in diary, events, field recording, improvisation, music, writing and tagged cello, collaborations, composition, drawing, experiment, experimental music, improvisation, label, language, meaning, meaninglessness, music, sonic diary, sound, wandelweiser. Bookmark the permalink.